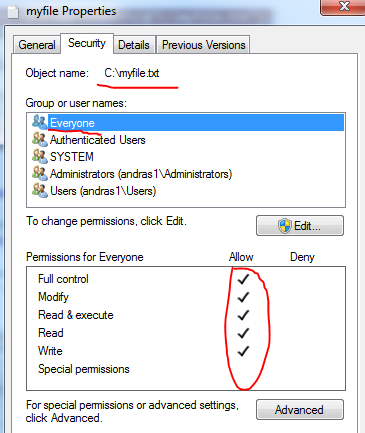 When creating a new file you can set the access control rule for it in code. There are a couple of objects to build the puzzle. The FileInfo class, which describes a file in a directory, has a SetAccessControl method which accepts a FileSecurity object. The FileSecurity object has an AddAccessRule method where you can pass in a FileSystemAccessRule object. The FileSystemAccessRule object has 4 overloads, 2 of which accept an IdentityReference abstract class. One of the implementations of IdentityReference is SecurityIdentifier. SecurityIdentifier in turn has 4 overloads where the last one is probably the most straightforward to use. Read all posts dedicated to file I/O here.